There are many mysteries surrounding Stonehenge and it’s giant circle of sarsen stones but there is a consensus that Stonehenge related to the Sun. For example, the Stonehenge Avenue and the Horse-shoe of Sarsen Trilithons are directly aligned on the solstitial axis (midwinter sunset – midsummer sunrise). There is far less agreement on its relationship with the stars and the moon. If you are interested in Stonehenge and its relationship to astronomy there are two excellent sources of information available. 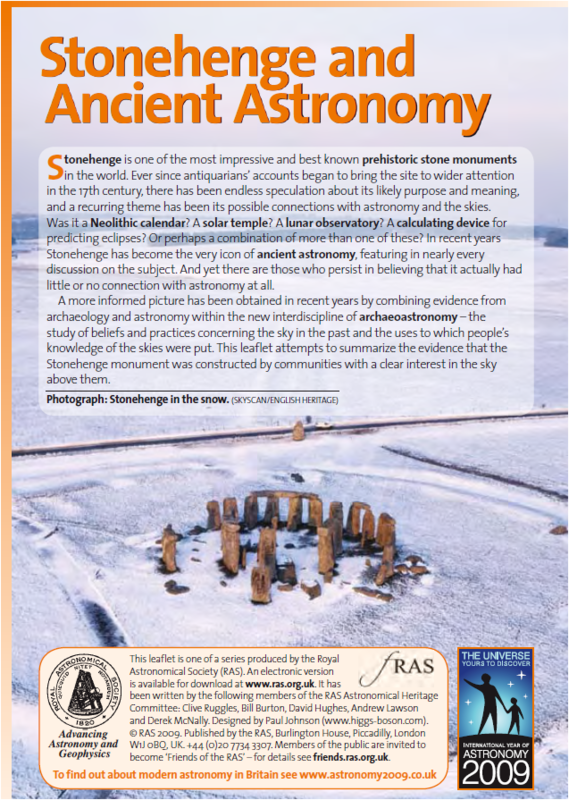 Firstly, The Royal Astronomical Society published a leaflet entitled Stonehenge and Ancient Astronomy in 2009. This leaflet was written by members of the Royal Astronomical Society Astronomical Heritage Committee and designed by Paul Johnson, reprinted 2012 by Armagh Observatory with funding from the NI Department of Culture, Arts and Leisure. 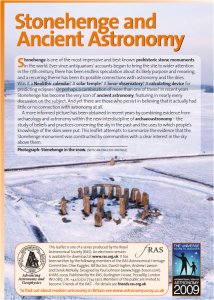 The leaflet is available in hard copy and as a pdf and discusses astronomy at Stonehenge and in relation to a number of ancient sites. This contains a wealth of information related to heritage and astronomy, including a number of case studies. An extended case study for Stonehenge has just been added. Please take a look to find out more about Stonehenge and Astronomy. You can find more information on astronomy in general on the Royal Astronomical website.